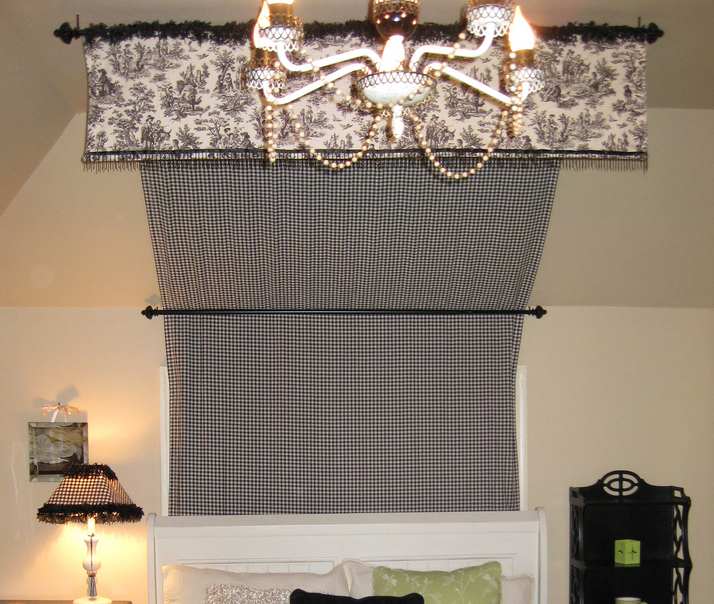 Want to make your own bed canopy? We made one for our daughter’s room about five years ago and it turned out pretty cute! It also doubled as a creative concealment, as there was an unnecessary and awkward window behind the curtain (I pulled the fabric back a little so you could see where the window frame is). Our canopy has three rods which follow the angled slope of her ceiling, but you could do this even with a regular ceiling. It is a fun way to add softness through fabric and to give your bed a little more dramatic presence! Plus, it feels so cozy to sleep under! And, if you want your canopy to be extra fancy like ours, get out your hot glue gun and add some fancy fur and bead trim! That is so cool. Very creative idea and it does a great job of making you forget that window is there at all. Have a great day! I love it! I think toile is devine! Thanks for the post! This is wonderful Melissa! Great inspiration. I actually have a post in mind, for Friday. It’s been awhile since I did a “Beautiul” post. Will see what I can do! And it’s TOILE!!! My favorite thing ever!!! That is absolutely stunning. My daughter has her eye on some hot pink sheers for her bedroom re-do (she’ll be 7 this year) and I just know I could convince her to work the black and cream toile in there somewhere! Lisas inspiring blog post..Toile-riffic Thursday #1: Toile Much Fun! Absolutely gorgeous! Love it. Once again, you amaze me!! Have a blessed day!! Marias inspiring blog post..Got Milk? What a great idea! I love it even more with the angled cieling. Your canopy is so pretty! I don’t think my boys would appreciate one, so I may have to try one for myself some day. Have a great day! Misti of Studio M Designss inspiring blog post..Outdoor Fabric: So 2009! this is really gorgeous! i will def have to check out that link. What a wonderful idea! I have one of those “unnecessary windows.” Hmmm…. What a wonderful idea! My daughter would really like to have something like this…hmmm. Laryssa @ Heaven In The Homes inspiring blog post..What is Etsy? awesome! and I love the black & white toile! Amanda-The Eck Lifes inspiring blog post..Going, going, gone…. I’ve always wanted to make one like that- This may be the year to finally do it! Thanks for sharing- love your personal home ideas. Oh… so neat. I’ve always loved canopies. They look so romantic! I’ve never had one though. Those are a GREAT idea for awkward vaulted ceilings!!! I considered doing something similar for years until I came up with my accent stripe and dresses art piece! I may keep this in mind for the future, though, because I LOVE the way it looks! the BLAH BLAH BLAHgers inspiring blog post..Mind Candy Review: Chasing Harry Winston – Spring Book Swapaway! very cute melissa. it adds a lot of drama! i promised my girls a tent over their bed this year….when i have time to make it. i don’t know how i will do it but i will figure that out later. they want to be able to close it up. meg duerksens inspiring blog post..random. I love this idea-it feels so cozy to sleep under a canopy too-it’s like your own personal cocoon. We had one in our room in our first home, I loved it! I love the trim on yours too! Shelias inspiring blog post..I’m Back With Bells On and Tablescape Thursday! Lovely…as always. Can’t wait to see more as you make your house your home – creating sanctuary in all those wonderful spaces. Awww, so sweet! I remember my mother making a fake canopy for me similar to this one when I was a little girl. :) I thought I was such a princess! I will post a link back to you. I miss you. That’s all. Hope that things are going great in your new home and that your husband is doing well gathering a community. Great idea!! Love the black and white, too! Very unique. Not a big canopy person, but I can’t argue with the aesthetics of this one. Awww, yet another reason why I wish I had a little girl. Great job! AnNicole@OurSuburbanCottages inspiring blog post..Let’s Hear it for the Girls! My husband’s going to have a wonderful time (sarcasm here, LOL) when we have to run to JoAnn’s for fabric and supplies tomorrow! This idea is WONDERFUL!!!!!!! Kellys inspiring blog post..Put down that cookie…and that doesn’t mean in your mouth! I love this post. I am in a rental and we have an awkward window in our masterbedroom. 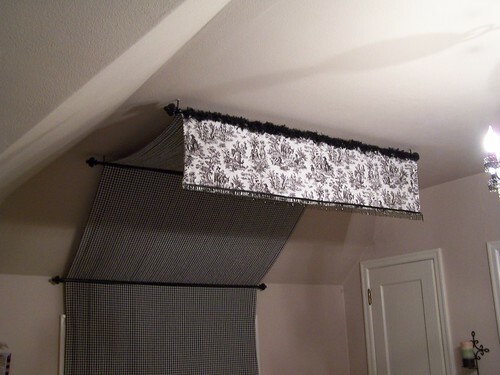 I am considering doing an adult version of this canopy to hide the window. My husband works midnights so the window is never opened or used so this would work perfectly. My only question, where is a good place to buy a ceiling mounted curtain rod? Or would eye hooks and wire work as well? Thanks, any tips would be great.